A perfect Valentine’s Day gift for anyone who loves cooking or loves the latest kitchen gadget is the MEATER+. The MEATER+ is the world’s first truly wireless smart meter thermometer that is designed to help you cook meat to your exact liking. The MEATER+ is perfect to use when cooking your Sunday roasts, ensuring your meat is cooked to perfection. It is also great to use on BBQ so they meat is cooked exactly how you like them. This Smart kitchen utensil is brilliant and is one no meat eater should live without. It uses patented technology so to provide estimated cooking times, monitor your meat whilst cooking and send alerts to your smartphone, giving you the freedom to step away from the oven. The MEATER+ is simple to setup and simple to use. It has a smart guided cooking system that guides you through every step of the cooking process. You simply place the probe in the piece of meat you want to cook. You then use the app to set the type of meat you are cooking and how you want it cooked. The app then estimates how much cooking time is needed. You then cook the piece of meat for the set time and enjoy! The MEATER+ is a fantastic gadget. It works by the probe connecting wirelessly to its charger which has a built-in Bluetooth booster. This then connects to the MEATER app on your smartphone with a range of up to 50m. The probe is safe to use and is made of stainless steel, is water resistant and very easy to clean. It is rechargeable and can be used with over 24 hours of continuous cooking. From the first time I used the MEATER+ I was very impressed with how simple it was to use and how well my meat was cooked. It is definitely a gadget I will continue to use every time I am cooking meat. 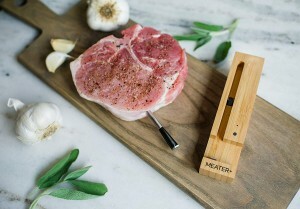 The MEATER+ is a fabulous gift for Valentine’s Day. The RRP for the MEATER+ is £99.00 and is available from ukstore.meater.com.